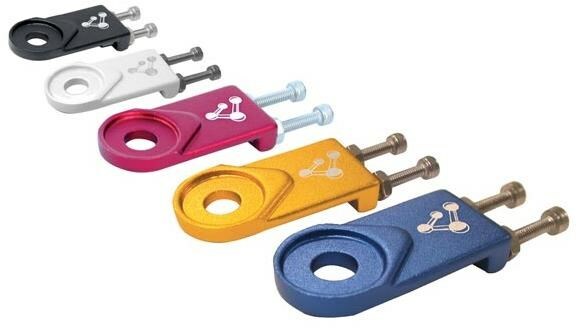 Keep your chain tightened and stop your wheel pulling forwards under pedal torque using these high quality, lightweight and simple tensioners. Simple to fit and great value for money. Lightweight forged aluminium with twin stainless steel adjusting bolts and locknuts. Shot peened and anodised colours with laser etched logo (or white powder coated). 10mm axle hole. (optional extra 10-5mm convertors allow use on QR skewers). Very smart, well made, effective and easy to use. Gives a very fine level of adjustment that stays firmly put once in place. A great piece of design that will complement any fixie build.